What is Bright Star Kids Family Club? When you make a free account you'll automatically get signed up to Bright Star Kids Family Club. You'll receive bonus reward points when you make an account, as well as every time you shop, along with a multitude of other things like reviewing products, signing up for our newsletter. It's really fun and easy to earn rewards, and best of all it's even easier to use them against future orders. 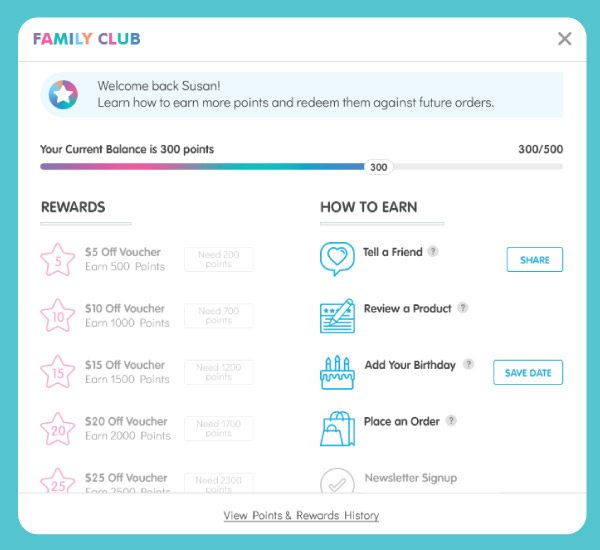 Click on the Family Club link in our main navigation to access the pop-up, which contains all of our Family Club Rewards in one handy place. See below for an example of how it might look for you. If you need help with how to earn or redeem points, please get in touch and we'll be delighted to help.